3. Section wise teacher’s are not there. Teachers merge the class and manage the subject classes. 5. Library books are there. Computer room is there and computer (15 nos) are approved. 6. AV room is there with projector. 7. School conducts 1 cultural program once a year. 8. Total school strength is 220 Students. 9. Additionally we told that we would be conducting 2 – 3 work shops on the Life Skills and Value education. For which HM acknowledged and welcomed. 2. A dedicated teacher to teach English for primary section. India Sudar needs your kind support to fulfill the needs. 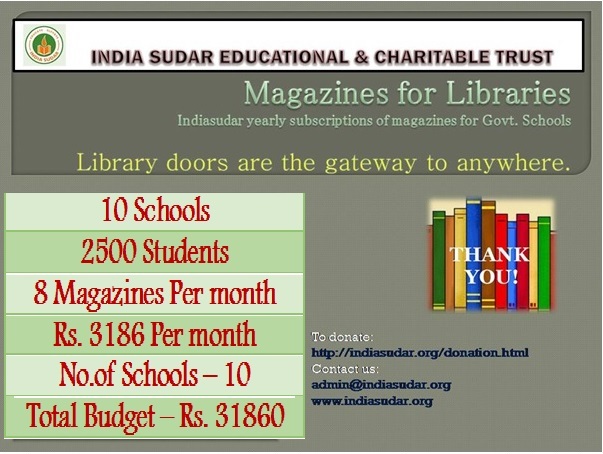 With your great support we have successfully implemented “School Magazine Subscriptions” for our onsite schools in last academic year and found overwhelmed co-operation/response from the school students and teachers. All these magazines are reaching the respective schools directly and students are utilizing these magazines to study and make them self aware about the current affairs and general knowledge, even in some schools teachers are utilizing these magazines to teach lessons. Moreover we have conducted general knowledge quiz programs in all these schools and distributed prize to winners. This will motivate students to use school library effectively.. Since the library and subscribed magazines are utilized properly we are extending our support for all these schools in the upcoming academic year 2018-2019 also. In this regard, we are inviting your support in this wonderful action.. You can contribute for one school or even partially is also welcome, "Little drops of water makes the mighty ocean". Kindly find the attached image in this regard. Thanks for your continuous support. Luck is not a simple one,when right person met right opportunity at right is called LUCK, Yes our school kids got an opportunity to interact with India Sudar SEBLA teacher Mr Periyasamy. It was really an eye breaking session on fundamentals of science ,which motivated the kids and enable them to think and think…. Kids are eagerly waiting such a wonderful sessions in upcoming academic year too. I am alumni of the same school,passed out in 2001. We have been doing many initiative to bring back and improve our school. For more interesting stories visit our school facebook page "SWOPANAMPATTU"